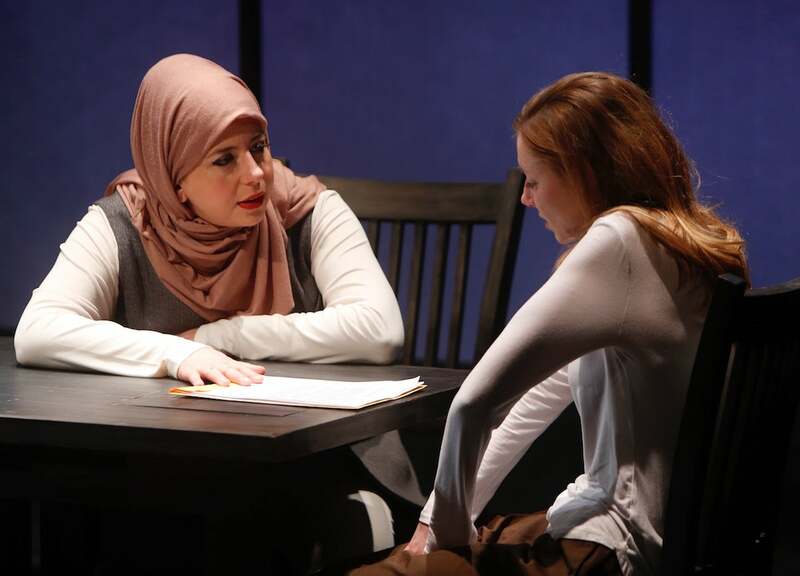 A tense and tightly plotted drama, Faceless made a splash with its world premiere at Chicago's Northlight Theatre last year. Now, with much of its creative team and cast returning, that acclaimed production moves to The Rep's Emerson Studio Theatre. Written by Selina Fillinger and directed by BJ Jones, the play runs from January 17 to February 4. In Faceless, two young women face off in a courtroom, locked in a battle of wills and theologies. Susie Glenn, 18, is on trial. Radicalized online into planning acts of terrorism, she’s zealously committed to her cause. Her prosecutor, Claire Fathi, is a Harvard-educated Muslim woman who lives the faith that Susie professes to understand. Their edgy exchanges create a propulsive, escalating tension that makes this brilliantly topical play a true legal thriller. Lindsay Stock (as Susie) and Susaan Jamshidi (as Claire) reprise their roles from the Northlight production. Michael James Reed (Hamlet, 2016) appears as lead prosecutor Scott Bader, while Ross Lehman plays defense lawyer Mark Arenberg. Joe Dempsey (Metamorphoses, 2003) rounds out the cast as Susie's father, Alan. Jones, Northlight's artistic director, directs. His design team includes scenic designer John Culbert, costume designer Izumi Inaba, lighting designer Heather Gilbert, sound designer Andre Pluess (Crime and Punishment, 2010) and projection designer Stephan Mazurek. Shannon B. Sturgis will stage manage the production. Tickets to The Rep's production of Faceless are currently on sale and can be purchased online at repstl.org, by calling the Box Office at 314-968-4925 or visiting the Loretto-Hilton Center at 130 Edgar Road (on the campus of Webster University). Ticket prices range from $45 to $69.50. Show times are Tuesday, Wednesdays and Sunday evenings at 7 p.m.; Thursdays, Fridays and select Saturday evenings at 8 p.m. Matinee performances are Saturdays at 4 p.m. and Sundays at 2 p.m.